Donald Trump listens to United Kingdom Independence Party leader Nigel Farage during a campaign rally on Aug. 24, in Jackson, Miss. Farage was a leader of the pro-Brexit campaign in Britain. The morning crowd at the Bulls Head pub in England's seaside town of Margate, an area that voted for the U.K. to leave the European Union. Many residents share the same political concerns as Donald Trump, but are highly critical of his rhetoric and policies. Margate, on the southeastern coast of England, feels left behind by developments in recent years. The town relied heavily on tourism, but discount air travel has led many Britons to bypass it and head to countries like Spain. Immigration has brought strains to social services in the town. Speaking in North Carolina on the final day of the presidential campaign, Republican nominee Donald Trump urged voters to go to the polls and deliver an Election Day upset. "It's going to be Brexit plus, plus, plus," he said Monday, referring to the surprise victory in last June's referendum in which the United Kingdom voted to leave the European Union. Trump has drawn parallels between the U.K.'s landmark vote to split with the EU and the success of his unconventional, anti-establishment run for the White House. Political observers here in the U.K. say some of Trump's comparisons are apt. "The obvious parallel ... is that this really is an instance where the whole of the U.S. media elites expect this man to fail and that was the same as in Brexit," says Anthony Wells, director of political and social opinion polling at the polling firm YouGov. In calling himself "Mr. Brexit," as he has in the past, Trump is suggesting he will pull off a win that will shock the world just as the Brexit vote did. But Wells says the electoral comparison isn't a good one. On the eve of last summer's referendum, Brexit was actually a toss-up with polls largely split between leaving and remaining in the EU. "The [U.K.] media were listening to the polls they wanted to believe," said Wells, accounting for the group-think in London where Brexit seemed hard to imagine. However, the vast majority of U.S. polls show Hillary Clinton leading anywhere from one to seven percentage points nationwide. According to the website, Real Clear Politics, Clinton was ahead in 17 polls, compared to Trump's four. NPR's battle ground map shows Clinton retaining a broad and consistent, if shallow advantage. Wells said a Trump victory is possible, but "unless there is some systemic polling error, Clinton should win." 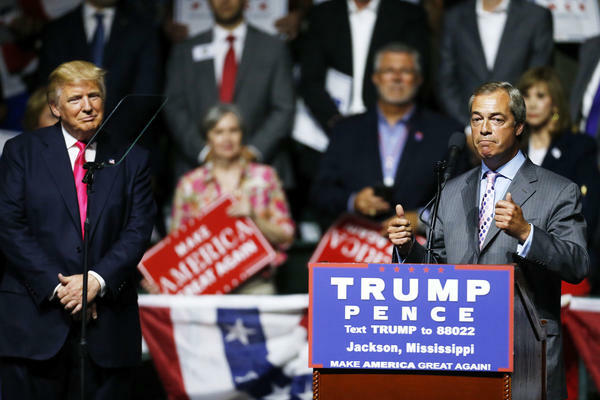 The Trump and Brexit campaigns do share a striking amount in common politically, showing that many of the issues that have roiled the U.S. presidential race resonate far beyond America's borders. 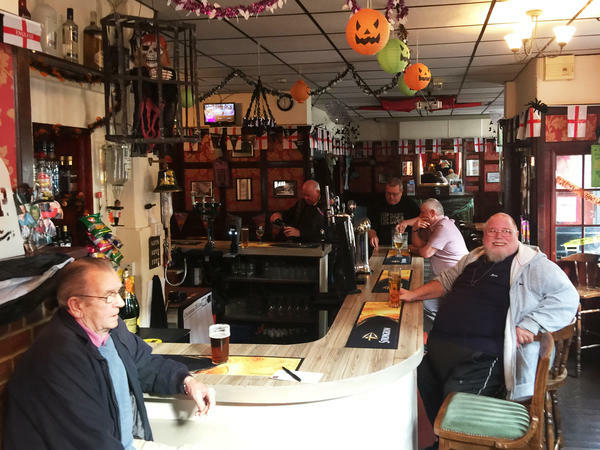 Step into the Bulls Head, a pub in Margate on England's southeast coast, and the regulars sound just like Trump supporters. This area of England voted heavily for Brexit and people at the Bulls Head worry about the issues Donald Trump talks about, such as the growing influence of immigration, a perceived loss of national identity and a sense that poorer communities are ignored by elites in the capital. For instance, Ali Burke, who owns the Bulls Head, says an influx of European children into the school of her daughter, Angel, began to hurt the girl's education. Margate is just 30 miles from the Channel Tunnel that connects the United Kingdom with France. Because membership in the European Union requires the free movement of people, Burke says many families from central Europe pass through looking for work. So many immigrant children poured into the school, that Angel had to help mentor and translate for a new student, even though she could not speak the new student's language. "She was so busy explaining to the other child what was going on in the lesson, that then she was missing what was being said," says Burke. Burke says she's not against immigration in general; it's just the heavy volume and lack of public resources to deal with it. "We've got to draw the line somewhere and we have to start putting our country first," she says. 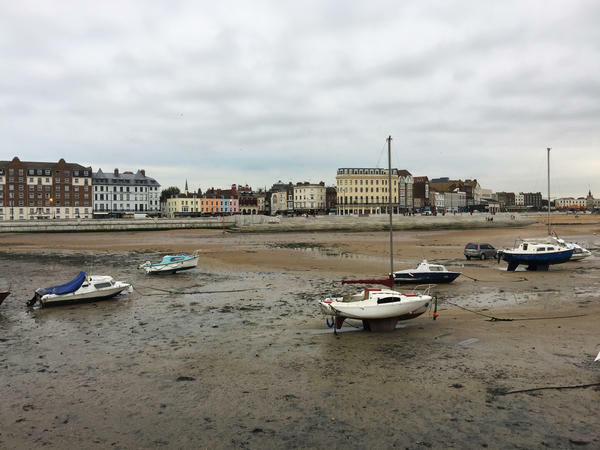 Some of the anger behind the Brexit vote was also driven by frustration with politicians in London, who people in Margate feel have forgotten about them. Margate was once a thriving seaside resort, but discount jet travel to countries like Spain devastated the economy and it's never recovered. Burke says she hasn't seen her member of parliament in a decade, but has met Nigel Farage, the interim head of the pro-Brexit United Kingdom Independence Party and the nearest-equivalent to Donald Trump on the U.K. political landscape. "I felt he listened," Burke says of Farage, who preaches an anti-immigration, take-back-Great-Britain message and appeared with Trump at an August campaign event in Mississippi. As for the politicians in London, Burke says: "They're out of touch. They live in their bubble. They live obviously in a land where there is plenty of money and plenty of work. I don't know if they know what's going on in places like Margate." If all this makes Burke sound like a natural Trump supporter, she isn't. Nor are any of the Brexit-voting regulars in the pub this morning. They share Trump's concerns, but find his rhetoric alarming and policy ideas, such as building a wall with Mexico, absurd. "I just cannot — for the life of me — understand how you can possibly be hoodwinked into voting for this gentleman," says Brian Justice, 85, a Bulls Head regular. Burke says if she had to choose between Trump and Clinton, she'd "have to flip a bloody coin." She is not ambivalent about President Obama. She adores him and is glad America voted in a black president. The candidate she wishes were running for president is the first lady, who has impressed her with her poise, thoughtfulness and speaking ability. "If I could," Burke says, "I would vote for Michelle."